With Climate Change, California Is Likely To See More Extreme Flooding Dams and levees across California are straining to handle winter storms. The state's water system was designed a century ago, before climate change was an issue. Now, the system is being rethought. 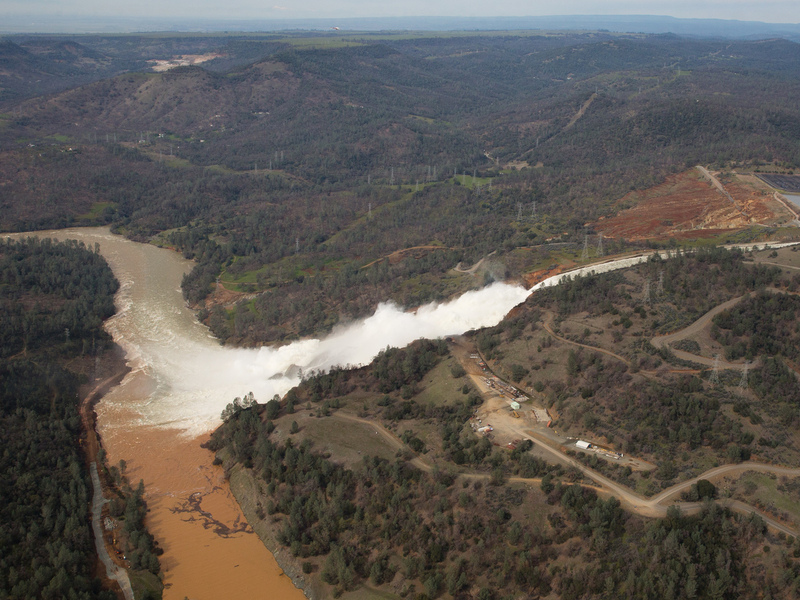 Almost 200,000 people were ordered to evacuate after a hole in the emergency spillway in Northern California's Oroville Dam threatened to flood the surrounding area. Climate change could be a factor of extreme flooding in California. Californians are in shock that after five years of too little water, the problem now is too much. All eyes in California have been on Oroville Dam, where a broken spillway forced major evacuations. But the damage from winter storms has gone beyond the dam in the northern part of the state. Downstream, rivers are running high and levees have been breaching. Some are calling this a wake-up call for California as climate change could bring similar damage. In the Sacramento-San Joaquin Delta, about 60 feet of levee is just gone, having been eaten away. A huge crane is dumping rocks in that gash to try and stop the river from breaking through. Steve Mello, a farmer on Tyler Island in the delta, about two hours from San Francisco, watches every rock load, anxiously gnawing on his cigar. 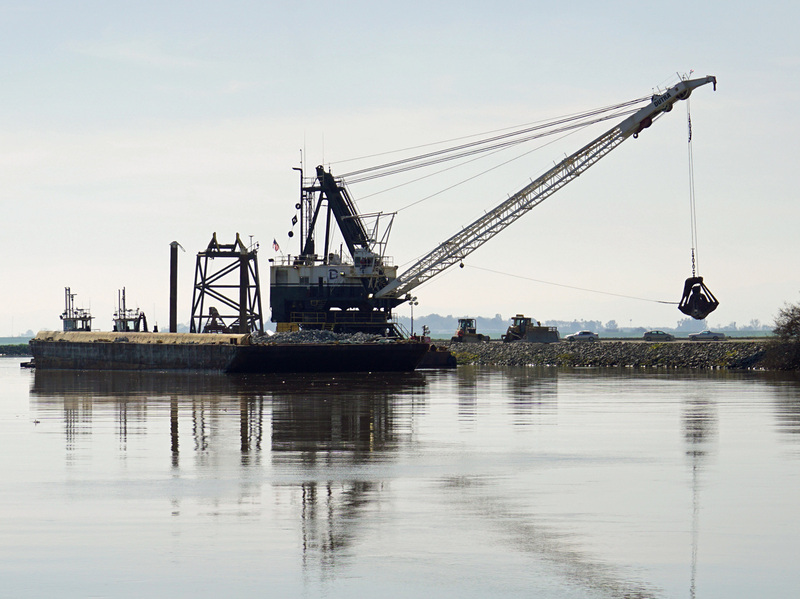 A dredge drops rocks onto a damaged levee in California's delta. "Every hour we work, we're safer," he says. "We're not out of the woods yet by a long shot." The farms and homes nearby would be underwater without this levee. Mello watched it crumble in only 15 minutes. The winter storms have stressed thousands of miles of rivers and levees. At one moment, the crew suddenly stops working and runs to check out another problem. But this shouldn't be a surprise, says Noah Diffenbaugh, a climate scientist at Stanford University. "It's actually exactly what has been predicted by scientists for at least 30 years," he says. He says California is likely to see more extreme flooding with climate change. And the reason is pretty simple. If it's warmer, storms produce more rain instead of snow. But that's not what California's water system was built to do when it was designed a century ago. It was built, in large part, around the snowpack in the Sierra Nevada. The state's flood system can handle that slow melt, but not a huge amount of rain all at once, Diffenbaugh says. "Our water system was really built in an old climate," he says. "It's a climate that is no longer the climate of California." So what can California do about this? Some are calling for more dams to be built. But Jay Lund, who directs the Center for Watershed Sciences at the University of California-Davis, says even if the dams are big enough to handle flood events, the channels downstream may not be able to. "This flood here has really tested us," he says. "We've found that we have quite a bit of levees to work on still." And, he says, dams aren't the only place to store all that runoff. "The biggest source of water storage in California is groundwater, and it always will be," he says. California is experimenting with spreading floodwater onto fields where it can seep into the groundwater. The groundwater needs recharging after being heavily used during the drought. But if the state is going to catch up to the climate it has now, there's still a long way to go.